When is the last time you had a perfect customer experience? It’s been a long time, am I right? It’s so common today to be faced with people who don’t know how to do their job, or do the wrong job, or don’t clean up after the job, that if we’re simply not mistreated we count ourselves lucky. This week my friendly Starbucks barista Junior told me that someone had given him an old MacBook Pro and he was wondering if I knew a place he could take it to get it modernized. He said Safari wasn’t rendering the web correctly and the only version of Firefox that would run was version 3! I couldn’t let him spend money for this, so I brought it home and upgraded it from Tiger (seriously) to Yosemite (in quite a few steps). He wants to do video editing on this machine (only 5 minute videos) and while I think that may be a pretty poor experience, it’s what he’s got so I wanted to make it as good of an experience as possible for the least amount of money. While an SSD might be a good addition, it might be wasted on this older machine, and since this little baby only had 1GB of RAM, the first order of business was to get that upgraded. I punched the serial number into one of those sites that will tell you the year and model and found the discontinuation date of 2008. 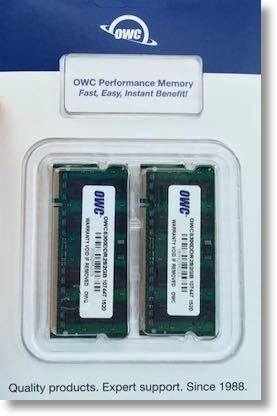 I jumped right over to my favorite source of RAM, OWC at macsales.com. I love OWC for many reasons, not the least of which is how easy it is to drill down from the memory tab to exactly your Mac model and then you know you get the right memory. I found the 2008 MacBook Pro model, and ordered a 6GB upgrade for $54. I went for the free shipping option from OWC and luckily there was no tax, and the memory arrived on Monday. I ripped open the 6GB package, opened the easy little door on the bottom of the MacBook Pro and pulled the RAM…and realized I’d somehow ordered the wrong memory! If any of you are paying close attention you’ll notice that I grabbed the discontinuation date, not the release date of the Mac. I ordered RAM for a 2008 machine when it was actually a 2007. Argh. This is where the great customer service story comes in. I went over to macsales.com and hit the live chat support button. In less than a minute, Brittany C jumped on and I confessed my error to her. The first thing she explained was that the RAM I bought for the iMac would work in the MacBook Pro so I wouldn’t need to make Junior wait again for the RAM to come in. I decided to stick with 4GB because on this older MacBook Pro a 6GB upgrade would run $127! We verified the models of both machines and verified what I needed. Then she wrote, “is there anything else I can help you with?” I answered, “well, yeah, you need to tell me if I can return the RAM I mistakenly ordered and opened.” But as I hit enter in our chat, I saw an email notification com in with the title “RMA Number from OWC”. Seriously, before I could even ask her she’d completed everything on her end. Even though I was an idiot and ordered the wrong product, Brittany C from OWC was efficient, trained, intelligent, polite and gave me a PERFECT customer service experience. Only 5 Macs?? I still have my original Mac Plus, a Pizza Box mac with Monitor, a red iMac, a flower power iMac, a blue iMac, 2 plastic iMacs, 1 aluminum iMac a 17 inch MBP, a plastic ibook, and 2 working macs. I need all of these computers because I have clients with them and each OS works different and i can’t remember the difference 🙂 my blue iMac runs system 7.1. You should download Mac Tracker. It will tell you what Apple says you cn upgrade RAM to, and what it can really take for Memory. As far as an SSD, it would be way over kill. Better to spend the money on an external monitor or a new computer. Nice, Barry. I do have MacTracker, huge fan forever. The problem is that in order to look up the Mac, you have to already know the year. Wait, I just checked something though that I could have used. In System Profiler I did find it was macbookpro3,1 and I can look THAT up in MacTracker and it does narrow it down to the year and model. Thanks for the push to look farther into it! Knowing which Mac you have, e.g., MBPro 3,1 is essential to ordering the correct memory. Just FYI, Crucial offers a free software tool that will report how much and what type of memory to nbuy for your Mac. Of course, it’s offered to help sell Crucial brand RAM. The SSD that replaced the old 160 GB 5400 spinner (already had the max usable 6gb, which is more than Apple originally said would work) makes an enormous difference. The old laptop runs faster and cooler, a very acceptable experience with SSD, not so much without. The old computer has a “slow” SATA interface, so don’t expect full throttle from the drive. That said, seek time for all those bits of OS X that move in and out of memory are greatly reduced. Given how cheap name brand SSDs are on Amazon, an extremely worthwhile upgrade. Buy at least a 256 GB Drive. And now that Apple has removed its blockade, enable TRIM. Thanks George, great resources as always. Money is a big deal for this guy so even the price of a 256GB SSD would be too much for him. I’ll let him use it for a while and see what he thinks. But FYI the Sammie 256 Evo is $90, there’s a Crucial for $85. That’s down with the price of RAM, and 128s are even less, tho that case is tough to crack, and 128s aren’t as good due to memory handling. If he’s not going to go SSD, and you still have his Mac or ear, run a Carbon Copy Clone, then clone it back. CCC writes sequentially, a very effective defrag that will speed the old drive some. Spotlight is the worst slowdown in Yosemite. If you want to speed up a Mac, disabling Spotlight and using Devon’s Easy Find is the best way I’ve found. Good point, Joe. Even if a seller doesn’t collect sales tax (a/k/a use tax), the buyer owes it. Oklahoma isn’t the most forward looking of states, but there’s an option to pay an amount allocated to use tax when filing income tax return. No adding up receipts, it’s based on gross income. Simple to calculate and not burdensome to pay. These are the facts that pave our streets, fill potholes, and keep cops on the beat so we can sleep safer at night. We, as a society, would be better off were there a national system to collect sales tax from online sales. Joe – The seller is not obligated to charge sales tax unless they have a presence in the state in which it was purchased. That’s not something about California. The state of California does ask taxpayers to estimate what they owe in sales tax for purchases out of state. Not very workable as they provide no way to calculate it. They just sort of hold out their hand and say please. Despite increases over the years – 10, then 12.5, now 15% – New Zealand’s Goods & Services Tax (GST) is brilliant in its simplicity. 15% on everything*, nationwide, collected by the seller, reclaimable on purchases by a business buyer. The only exemptions are residential house sales and rental, donations, precious metals and financial services. And if any of you Americans want to buy online from here, you don’t have to pay it. Most Kiwis don’t give a second thought to GST – it’s just something that’s broken out on the invoice. All sticker prices (for sale to end users) MUST show the inclusive price.Listed prices for business buyers usually show the exclusive figure, even though the inclusive figure is paid. While local retailers will cry “hooray!” at the levelling of the playing field, they will still lose out if they can’t supply the range of goods. And if they charge enormous prices in the first place.